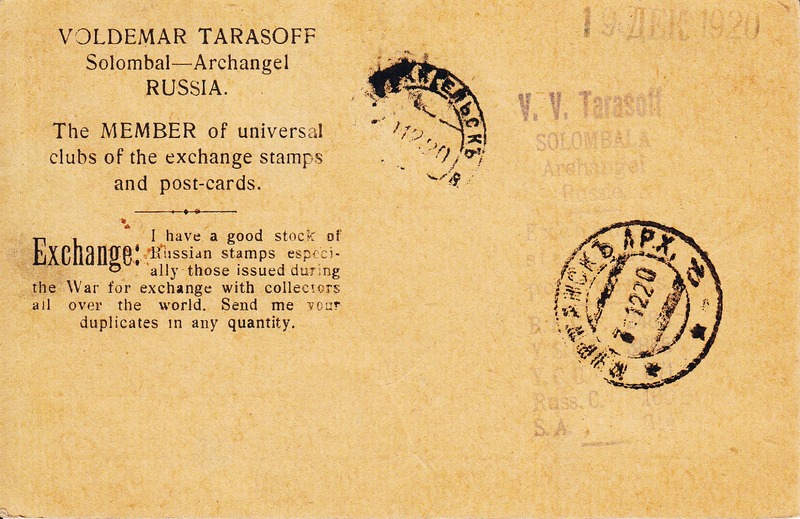 Anyone who collects Russia postal history from 1917 through the 1920s will, at some point, come across the printed cards of V V Tarasoff of Solombala, Archangel, who publishes a collectors' magazine in English and invites philatelic exchanges. Who is this man? In a 1970 Rossica article, Andrew Cronin says that he was a printer - which makes sense from the varied printed cards he uses - and that sometime in the 1920s he moved to Leningrad from where he was sending out cards as late as 1937. By that year, anyone doing that sort of thing was running very considerable risks - stamp collectors with foreign contacts were regarded as security threats. In 1941, the NKVD had them listed as a category of people to be investigated when they occupied Latvia. [Added 19 April 2015: Alexander Epstein tells me that in the 1930s Tarasoff was manager of a Soviet Philatelic Association shop in Leningrad. On that basis, I would guess either that Tarasoff died in the Purges or in the Siege of Leningrad]. But what is someone doing in Solombala ("of all places" Cronin remarks) and how come he commands very good English, which he writes very neatly, and who cares enough about correctness to have apostrophes after "Collectors' " and "Correspondents' ". A very little Googling suggests that he was a Doukhobor or the descendant of Doukhobors. They were a Russian religious sect, exiled to the corners of the Empire in the 19th century and most famous for their pacifism - at the end of the 19th century, they conducted ceremonies where rifles were burnt. Tarasoff is a Doukhobor family name and Archangel was one of the ends-of-the-earth places to which they were exiled. Many emigrated to North America (Saskatchewan and Oregon) and it is possible that Tarasoff originally needed English to correspond with family members. There is another curious possibility. From the 18th century and into the 20th, the northern ports received foreign ships regularly. The visits from Norwegian ships gave rise to a dockside pidgin language well known to linguists as Russnorsk - a mix of Russian and Norwegian. But Google also tells me that there was a port pidgin called Solombala English, about which little is recorded. So it is just possible that Tarasoff was helped on his way by the fact that the Archangel port areas were places where some English was spoken. Now to the card. 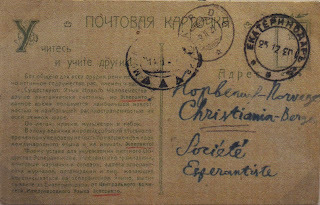 Written on 29 December 1918 it is correctly franked according to the RSFSR tariff of 10 March 1918. The postmark of SOLOMBALA ARKH, is not date-legible (it could be the 30 or 31 December or 3 1 19) but what is legible is the British censor cachet in violet - at the end of 1918 the area was occupied by British Intervention forces. 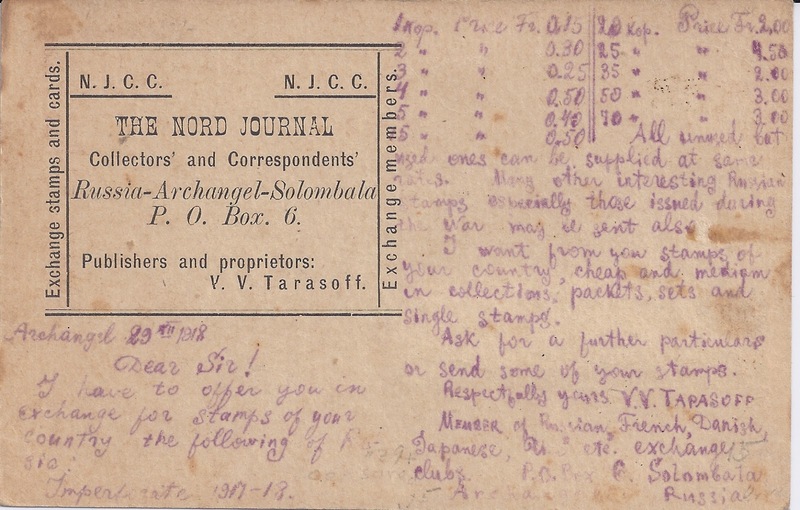 The card then went out into the Arctic winter and got to the far-north Norwegian port of VARDO on 20 February 1919 and from there overland down through Norway and then on to Holland, where a typical C292 cachet was applied. 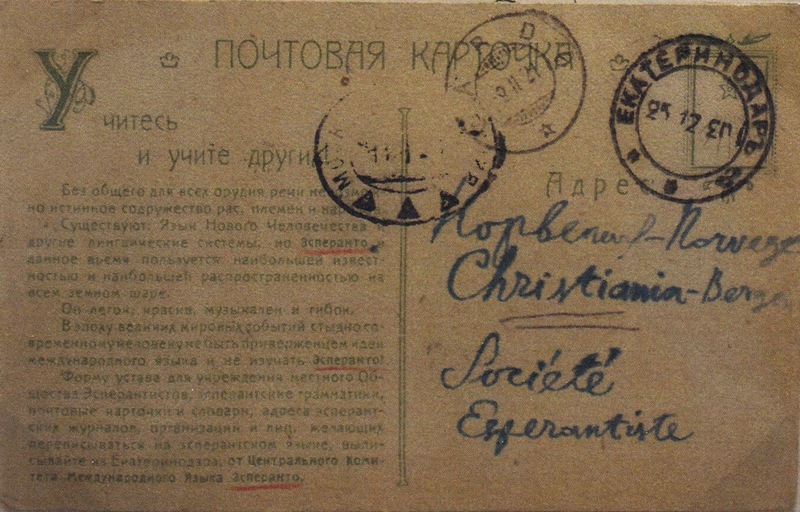 A remarkable journey - and one no longer possible for RSFSR mail. .... and Jan Lauridsen in Vardø has sent me scans of a very, very interesting Tarasoff card. 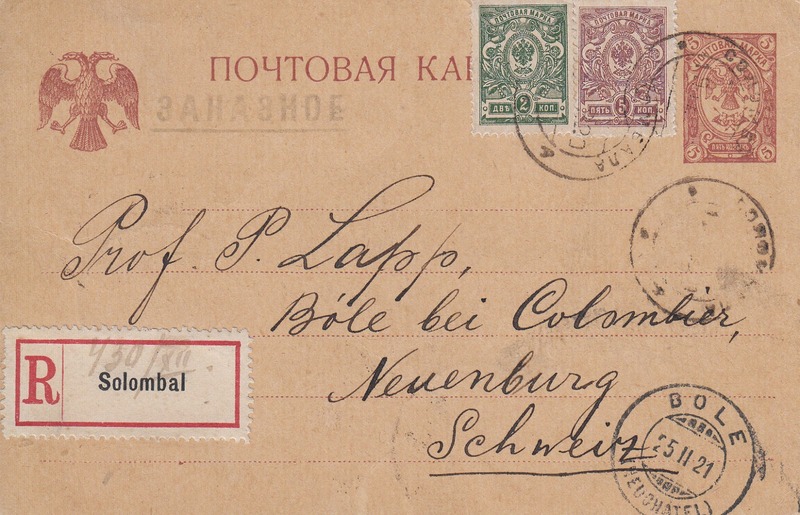 You will see that it is registered from Solombala in December 1920 and addressed to Switzerland. 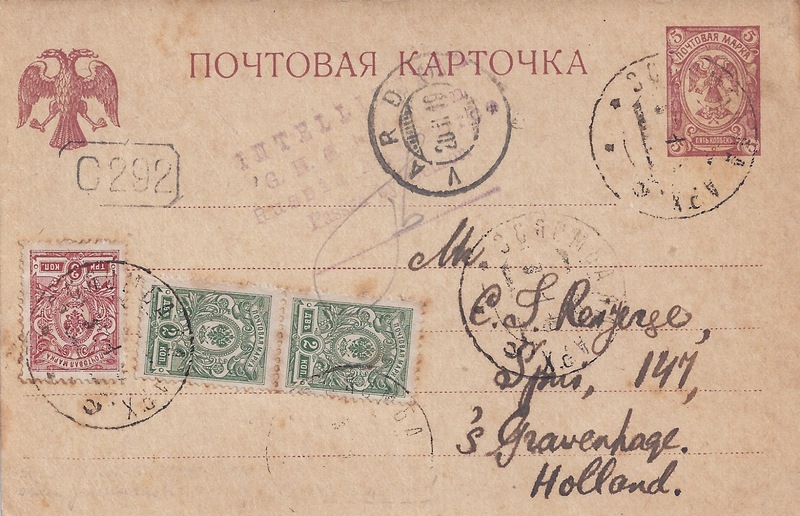 The Kerensky card is used as a Blank and the Imperial Arms stamps are revalued x 100 to give a correct - and very rare - 7 rouble franking for a Registered postcard going abroad (Tariff of 30 September 1920). Most importantly, the reverse shows an ARCHANGELSK transit cancel - and also a MURMANSK cancel. This last proves that the card went out by sea (in the middle of the Arctic winter), northwards and westwards towards Norway. At Murmansk the card would have been transferred to a ship headed for Vardø. 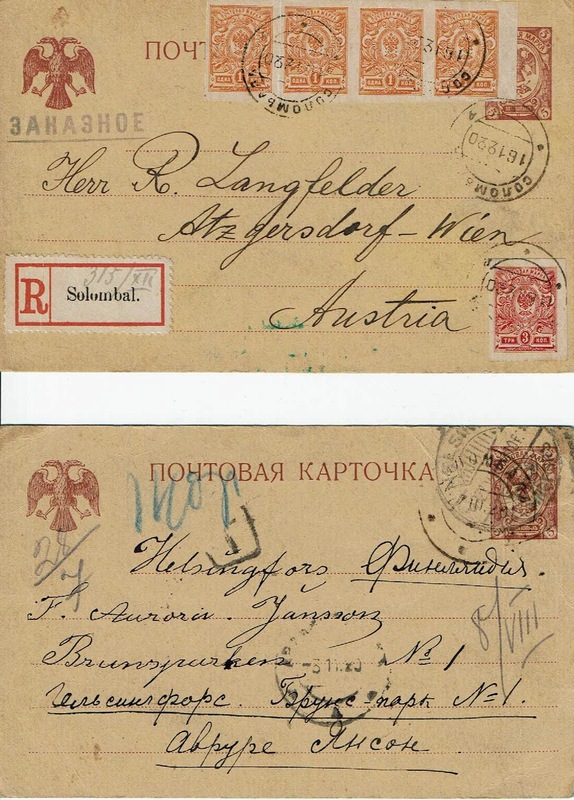 By 1921 or 1922, as foreign mail handling was centralised, the card would have travelled south - overland - to Moscow or Petrograd and been censored there before being sent on to Switzerland, probably via Germany. But here we have the Northern route still being used, just as it was for the British Occupation card shown above. I am very grateful to Jan Lauridsen, who is a specialist collector of this Northern route, for letting me show his card here.